With little or no lasting relief? Who can benefit from CranioSomatic Therapy? A cranial approach to treating chronic musculoskeletal pain and dysfunction. Techniques developed by Dr. Hancock to eliminate chronic musculoskeletal compensatory patterns, discovered using applied kinesiology and other techniques. These patterns respond poorly to most other forms of treatment, including chiropractic, other cranial techniques, various soft tissue therapies, reflex techniques and others. These chronic patterns do respond to CSI, which provides long-term cranial corrections, allowing the body to achieve improvements in posture and musculoskeletal function. Many of these symptoms can be attributed to compensatory changes in postural alignment and musculoskeletal function which have occurred in response to the position of the bones of the cranium and the function of their related soft tissues (i.e., muscles, fascia, dural attachments, etc.) of the head and neck regions. The individual bones of the head normally have slight, but limited movement, at their sutures (junctions with other bones). Collectively, when the bones of the cranium are moved as a functioning unit, an impressive amount of movement is possible. When movement is compromised at individual sutures, the result is alteration of specific and predictable muscle function elsewhere in the body. When the cranial bones are restricted as a unit (e.g., a sphenobasilar strain pattern) the effects on muscle function are diffuse and result in specific and predictable global changes of musculoskeletal function and postural alignment. CranioSomatic Therapy® addresses restricted cranial patterns and generally results in marked improvement, if not total elimination, of many postural and musculoskeletal symptoms. It should be noted that cranio (head) – somatic (body) relationships are reciprocal. 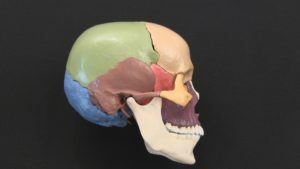 Changes in postural alignment and/or imbalances in musculoskeletal function typically result in predictable compensatory changes in the position and function of the osseous and soft tissue structures of the cranial region. Bring Us Your Most Challenging Conditions and Cases! Click here to explore the workshop information, as well as the current schedule of classes and registration information.